When it comes to the home improvement retail industry, Home Depot and Lowe’s own the market. Despite growing competition from the likes of Amazon, consumers are happy with Home Depot and Lowe’s. According to a survey by YouGov uncovering America’s best-perceived brands, they both rank in the top 10. Despite their success the home improvement retail category is challenging when it comes to delivering a consistently positive customer experience: simplifying the complexity of tools, materials, and expensive projects on what is often consumers' largest lifetime investment. Not to mention keeping their brand top-of-mind throughout consumers' lifelong home improvement journey. “Everyone loves to quote that 80% to 90% of purchase decisions are made by women” - Trish Mueller, former Chief Marketing Officer. Home Depot’s purchase data revealed that their buyers were mostly men, which drove predictably male-focused marketing initiatives for years. However, once Home Depot started observing its customers in-store, they found that although women made all of the decisions in-store, men would often pay at checkout, which skewed their data to look like more men purchased than women. In addition, Home Depot’s transactional data couldn’t identify “honey-do” purchases. My focusing not only on transactional data but also focus groups and in-store behavior they found that their target audience was (relatively) evenly split between men and women. With that realization Home Depot made new efforts to expand their marketing and in-store experience to focus on women. In 2010, the brand started DIY workshops for women, which had a huge turnout, and the company now holds one women’s workshop every month in all stores. Home Depot has also improved its in-store experience for women by decluttering their stores, providing better lighting, and adding product lines - like Martha Stewart - that appeal to women. Home Depot focuses on appealing to professionals and the average “roll your sleeves up” type of consumer, with dusty concrete floors, industrial lighting and bulk offerings creating a real handyman/woman type of atmosphere. Customer service in-store, for both professionals and consumers, is where Home Depot strives to succeed in winning lifetime customers. “Our goal is to help both professional contractors and average consumers solve problems,” said Kevin Hofmann, Home Depot’s current CMO. “You learn so much in the aisles. We’re trying to walk in the shoes of our front-line associates, because that’s our differentiator. There are lots of places you can buy a drill. We want you to come to us because we’re not just interested in the transaction, but in the relationship and in your lifetime purchase behavior. The holy tenets of retail are convenience, selection, value and service. Convenience, selection and value tend to get people in, and service is what brings them back.” Home Depot trains its employees with the most current learning resources and empowers them to share relevant information from their own experiences to add value to the customer experience. “Our position is to be an everyday, low-price place. You don’t have to wait for a sale or a gimmick. You know that you’ll find a great value. Our message to the marketplace is, Home Depot has the best brands and best products. We help you save time and money and turn a house into a home,” said Hofmann. Home Depot also knows its competitive advantage over others with similar low price structures (like Amazon) is that they’re selling projects, not items. For that reason consumers would often rather purchase in person where they can talk to a professional about their needs. As an added incentive, when consumers shop in-store, Home Depot matches competitor prices, plus an additional 10% discount with proof of a lower price. Though online purchases are not eligible for the 10% guarantee, they are still eligible for price match if the competitors' lower-priced item is available to be shipped to the customer's location. In November 2017, Home Depot’s mobile experience received Forrester’s top overall score for functionality and usability. Their mobile experience is unique because it achieves a two key goals: bringing consumers to stores and helping them have a good in-store experience. First, the mobile app has augmented reality capabilities, so shoppers can view what items look like in their homes before they make a purchase. “One of the biggest barriers for consumers is visualizing, so we’ve blended the physical and digital world,” Hofmann said. Home Depot’s mobile app removes frustration, whether shopping online or in-store. In the app consumers can easily chat with a store associate for quick answers. The mobile app also helps users quickly locate items once they are in the store, as the entire store is mapped out on the back end of the app. Home Depot puts so much stock into the mobile app because, “There is a stronger connectivity between mobile and stores than there is between our desktop site and the stores. 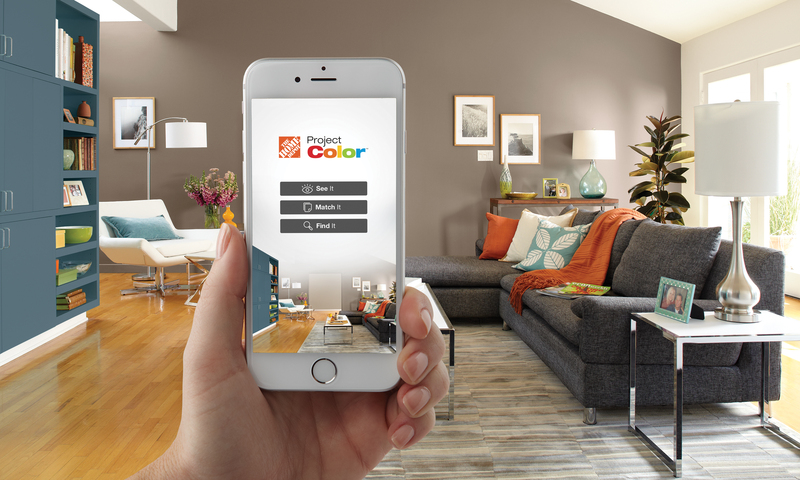 Mobile is the bridge between interconnected retail,” says Matt Jones, Senior Director of Online/Mobile Products for Home Depot. Factoring in different points of data from mobile users is a way of understanding how mobile adds value to the business. “Sales are the macro-conversion but when users lookup our store hours, or a store phone number or driving directions, those are other mobile conversions that will potentially lead to a physical in-store purchase,” says Jones. Since the mobile site launched, the cost per macro-conversions has decreased by 75%, and the company is now closely monitoring the other more granular types of mobile conversions. The appeal of DIY projects among millennials continues to grow, even as they challenge the norms behind homeownership. That along with Lowe’s commitment to “Help people love where they live” resulted in the creation of UpSkill, a training program designed to empower consumers to complete DIY projects on their own. The UpSkill program was especially impactful in the wake of Hurricane Harvey, when Lowe’s provided technical skills for communities that needed help to rebuild their homes and businesses. The purpose-driven commitment to helping people love where they live aligns with the goals of the millennial generation. With over 60% of participants being millennials, helping them overcome knowledge barriers around home improvement and gain confidence to continue DIY work in their homes and communities is a large part of the program’s mission and success. The program also helps to build deep relationships between customers and associates, which allows Lowe’s to better serve their needs and create a unique, personal connection to their local store for future home improvement needs. 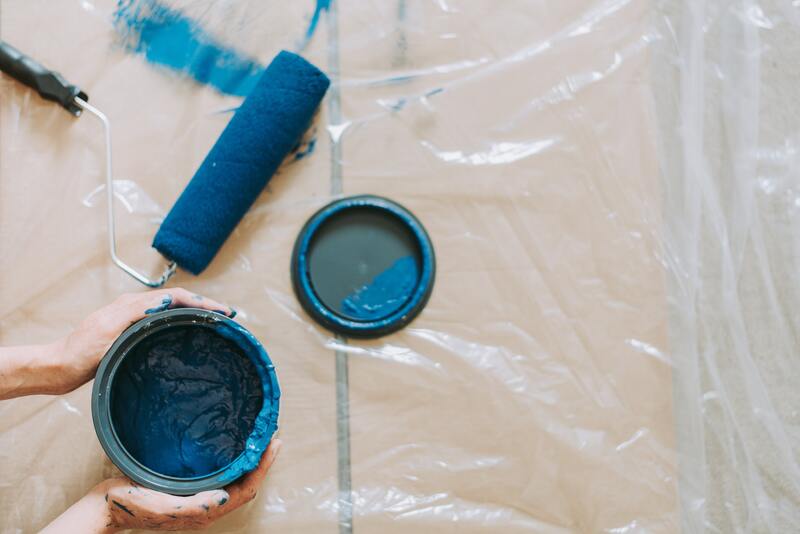 Keeping with the DIY trend, Lowe’s uses social media to help consumers see the brand as a helpful resource for home improvement knowledge. 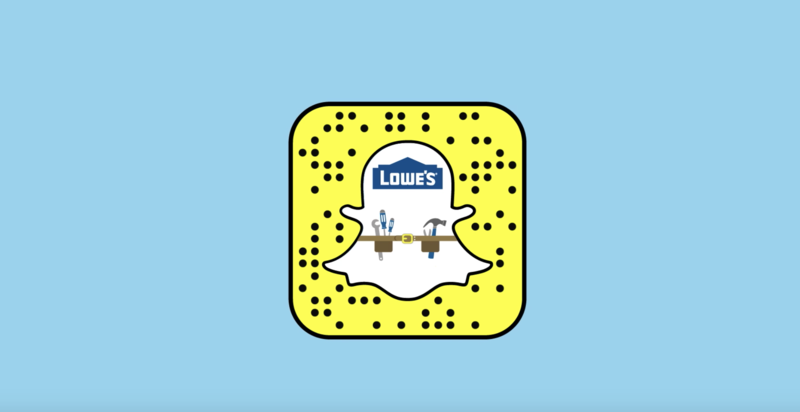 Lowe’s used Snapchat to create a series of videos called “In a Snap” where viewers can hammer, drill, or chisel to complete a DIY project by tapping the right place. When Instagram released Stories, Lowe’s converted “In a Snap” into Instagram stories by showing how to makes some simple design updates to your bathroom. Part of Lowe’s success in marketing stems from their ability to tailor messages to individual consumers by linking relevant information such as their location, interests, and previous purchases across all channels from email to paid search and social network ads. “We need to be relevant to shoppers,” says Shannon Versaggi, Vice President of Targeted Marketing at Lowe’s. “That requires us to personalize the messages we’re presenting them.” Knowing where a shopper is located has provided significant results for Lowe’s. A customer located in Los Angeles in February is unlikely to be interested in the same items as a shopper in Minneapolis. Their online ads layer weather-related triggers on top of location-based targeting to reach consumers with a more relevant message. Using undisclosed marketing vendor tools to deliver personalized messaging at the right time, Lowe’s is able to determine when, where, and who they should target. Additionally, they leverage machine learning to understand the types of messages consumers respond to in a particular situation, allowing them to optimize their ad spend accordingly. Lowe’s goal is to show shoppers that it understands them and what they're looking for, delivering messages that make finding the right home improvement products easier. “Home improvement can be intimidating,” Versaggi says, implying that when customers take on a project there are endless decisions to make. Lowe’s ability to tailor messages to consumers’ interests and behaviors, as well as track the impact of its ads has led them to allocate roughly 45% of their marketing budget to digital ads this year. To enhance the customer experience, Lowe’s is investing heavily in their omnichannel retail strategy. Advancing the omnichannel experience makes it easier for customers to engage with Lowe’s interior and exterior home project specialists, as well as drive more customers to their stores. As an example, Lowe’s added easy online scheduling capabilities, which have lead to a large number of customers scheduling in-store appointments with specialists. Online sales for Lowe’s are on the rise and those sales are boosting more in-store sales. An impressive 60% of online orders are being picked up in-store, with 40% of those customers buying additional products once there. They also utilize "Measured By Lowe's," which is an app that enables customers to take, save, and send measurements for home repair work. The app turns an augmented reality-enabled iPhone or iPad into a digital tape measure that can calculate, align, layer and filter measurements - and again for their millennial shoppers, they can even share their experience on social media. Relative to omnichannel, Lowe’s recognizes that technology is not only about supporting products and services, but also about delivering a cohesive customer experience. Because of that focus they were recently recognized by Forbes in its first ever top 50 Most Engaged Companies list. The company placed 9 out of the notable top 10, including customer-focused companies like Amazon, Alphabet, Nordstrom, and Starbucks. The rankings were based on "social media engagement, Net Promoter Scores (NPS), and year-over-year sales growth." Specifically impressive, the net promoter score is a well-respected gauge of customer satisfaction that measures their willingness to recommend a company to friends and family. In addition to omnichannel strategies that improve the customer experience, in select stores, Lowe’s shoppers can try and buy smart home products from brands such as Google, Sonos, Nest, Samsung and Ring. The in-store pop-ups provide shoppers with a more hands-on in-store experience allowing customers to touch, test, and compare products. Both Lowe's and Home Depot have remained diligent and competitive to win over their customers as well as remain some of America’s favorite brands. Lowe’s and Home Depot’s strategic marketing efforts focus mainly on leveraging tactics that ultimately encourage more consumers into their stores, while using mobile, data, and omnichannel strategies for improving the in-store experience to keep those customers coming back.